Watch “The Takeout” with Major Garrett and Steve Chaggaris on CBSN -- Fridays at 9 p.m. -- or on the CBS News app on iphones and android devices as well as Apple TV, Amazon Fire, Roku, Playstation, Xbox and Chromecast. 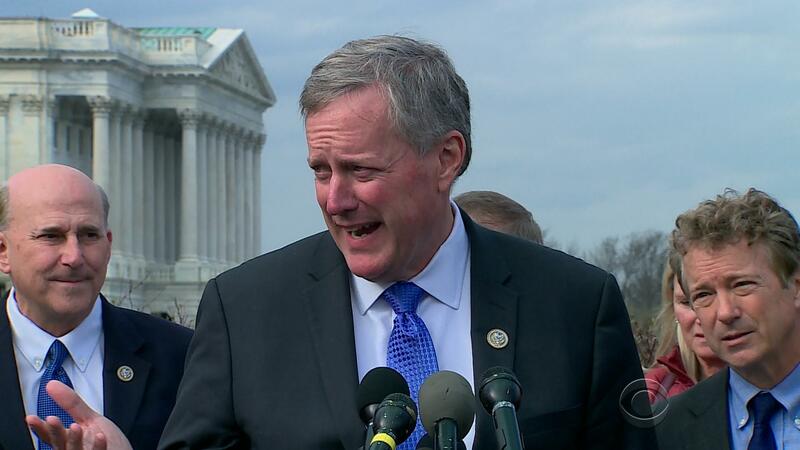 The fate of the Republican health care bill in the House could well be determined by lawmakers like Rep. Mark Meadows, the congressman from North Carolina who chairs the Freedom Caucus. That’s the group of around 30 of the most conservative congressmen in the House. For now, the caucus hasn’t taken an official position on the American Healthcare Act, but many of the members have made no secret of their opposition to the GOP’s bill, including Meadows. Meadows wants some big changes to the bill put forward by Speaker Paul Ryan and supported by President Trump, he told CBS News’ Chief White House Correspondent Major Garrett in the latest episode of “The Takeout” podcast. But he also said that he’s willing to compromise, in the interest of moving forward on an ambitious Republican agenda. House Republicans are in a hurry to get this plan passed. “The pressure cooker is huge. The internal goal is to have it done by our Easter break,” Meadows said. The changes he wants are big ones. He and Sen. Ted Cruz, of Texas, wrote a Wall Street Journal op-ed recently enumerating the things they feel the bill must do: lower insurance premiums; implement non-refundable tax credits, rather than the refundable tax credits that are in the current version; and freeze Obamacare’s Medicaid expansion. The current iteration of the plan doesn’t stop the Medicaid expansion until 2020 -- too late, in Meadows’ opinion. What does Trump see as the best moment of his first 100 days? “We are willing to move more than halfway to get a deal, and that’s something that doesn’t get reported, so you’re reporting it here, because getting along doesn’t normally make headlines,” he said. The Freedom Caucus chairman also explained why it is that Republicans are in such a hurry. For more from Meadows’ conversation with Garrett and CBS News Senior Political Editor Steve Chaggaris, listen to “The Takeout” podcast, available on iTunes, Google Play, Stitcher and CBSNews.com. And follow “The Takeout” on Instagram, Facebook and Twitter: @TakeoutPodcast.